Clearly something needs to happen. Someone needs to give the biggest motivational speech anyone has ever heard. This team needs to get some sense slapped into them, because this season is going downhill really fast. This is the game that the Ducks need, though. The Ducks hate the Washington Huskies. I would sure hope that they have no problem getting pumped up for this game. The Huskies are coming off of a big upset of USC down in the Coliseum and the Ducks are coming off a disappointing loss to the Cougars at home. The Ducks may finally catch a break this week, though, with the possible return of Vernon Adams at QB. Chris Petersen, the Huskies’ head coach, is a master of the mis-direction and trick play. Last week, the Huskies pulled off the upset with the help of some trickery, so let’s look at some of this. Browning and Gaskin must carry out the play action perfectly. The Huskies new true Freshman QB, Jake Browning, is quite the passer. He shattered national high-school records, career and season. He has the potential to be something similar to Jared Goff, bursting onto the scene and becoming a great pro prospect. 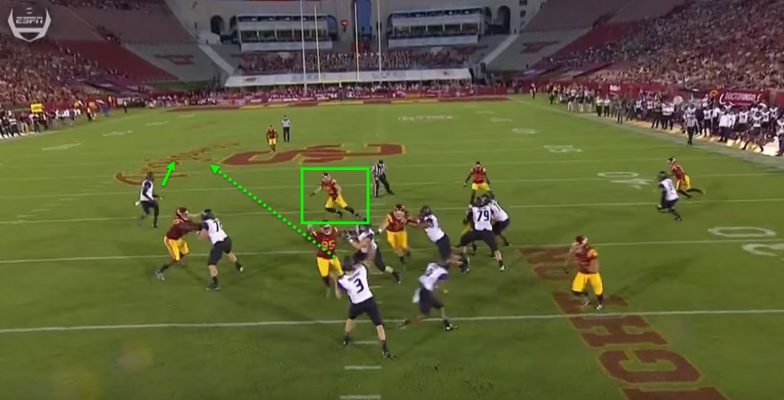 Browning’s passing prowess allows Petersen to throw as much as he wants. The first play, above, illustrates this. 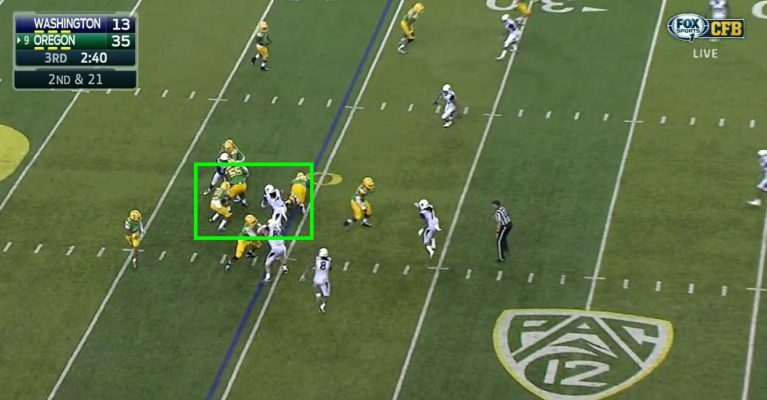 As you can see in the screenshot above, the Huskies are lined up in trips left with the quarterback in the shotgun and the running back to his left. The Trojans defense is lined up in a 4-3 across from them. As you can see, Browning is already throwing the ball before the back gets past him. 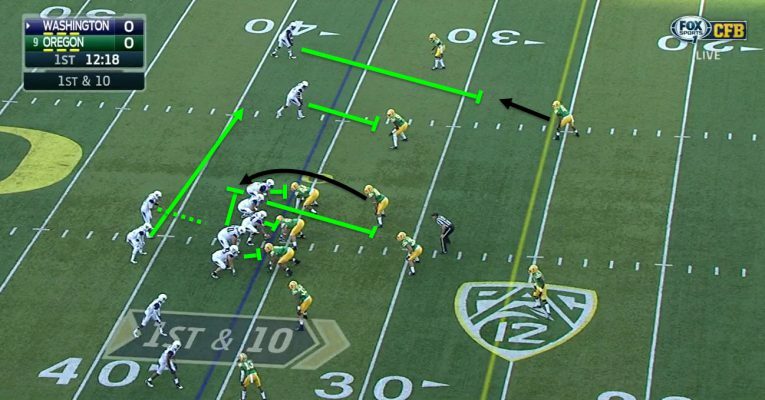 At the snap, the Huskies are going to run a play-action, building on their ability to run the zone read. 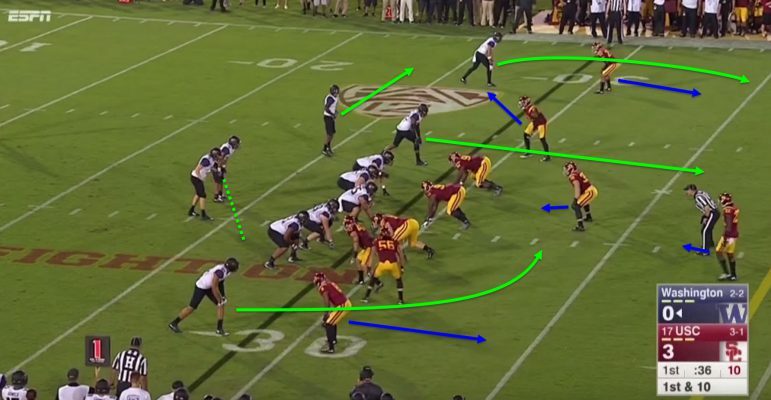 The Trojans know that they can run the option, and the youth in the defense leads the defense to commit to the run a little more than they should. The Huskies also run many bubble screens, which is the route the middle receiver is running. The other two receivers/tight end in the trips are running go routes. Finally, the receiver (wide right) is running a drag route. The tight end is wide open for a big gain. The play action fake is carried out perfectly, drawing in the linebackers. This opens up the middle of the field for the tight end. Browning sees this and very quickly tosses the ball to his tight end for a big 18-yard gain. This play is called the pop pass because of the quick play action and read and throw. If the tight end wasn’t open because the linebacker didn’t fall for the fake, the drag route should be open. 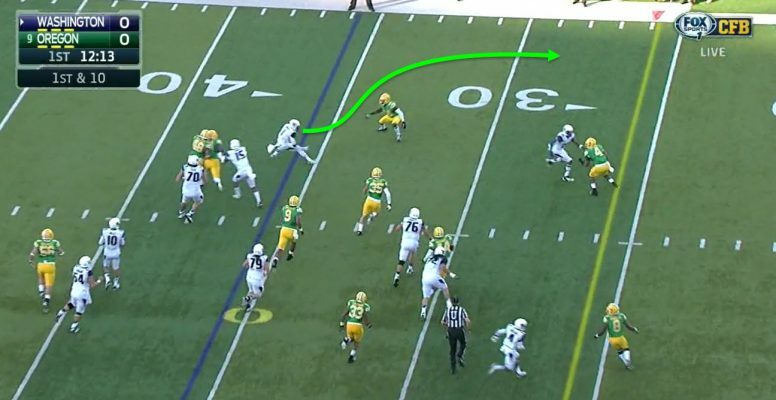 The Huskies option wants to get the running back to the outside, such as a sweep. The play action only works if they establish a run game with the zone read. Let’s take a look at how they run the zone read. The Huskies begin lined up in doubles, with playmaker, Jaydon Mickens (No. 1) in the backfield. Mickens is a speedster, though he usually plays receiver, so this year’s speedster at running back is Myles Gaskin. Washington loves having speed at running back so they can reach the edge. The quarterback reads the linebacker and hands it to Mickens. Once the ball is snapped, the right guard, center, and left guard all block whoever is in front of them, while the right tackle pulls to block the right linebacker. The left tackle is going to get to the second level and block the middle linebacker. The quarterback is reading the right linebacker, despite the fact that he is going to get blocked. The quarterback is going to read how the tackle is going to be able to get the block off. If the running back is going to have any chance of getting around the linebacker, the quarterback gives him the ball. Mickens in a one-on-one wins that battle every time. 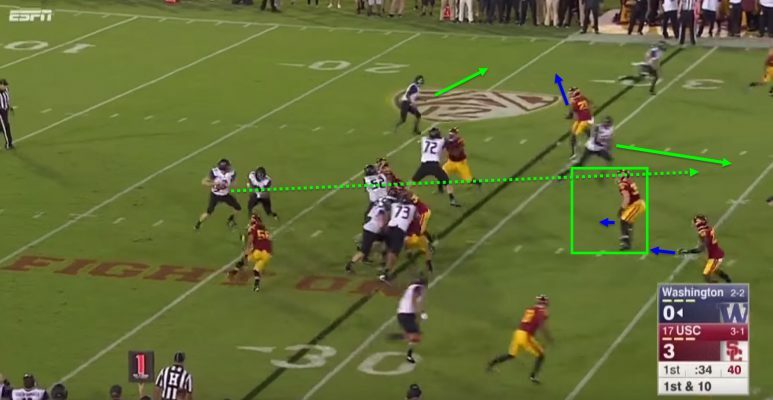 This is what the quarterback reads, and so Mickens gets the ball. The receivers get the blocks on the corner and safety, leaving just one man to stop Mickens, which is not going to happen. Mickens puts the lone corner on skates and gets a big gain of 12 on 1st & 10. A good read and speedy back leads to big gains for UW. The Huskies defense has been stingy. Just ask the Trojans. The defense is stingier than last year’s, not as sack happy, but it is much harder to gain yards on them. The Huskies defense makes plays from many different positions, despite the loss of four players on defense to the NFL. The Husky defense is going to come out hungry and confident. Last year, Mariota was able to figure out the Husky defense; this year, an injured Adams, Jeff Lockie or Taylor Alie has yet to really prove they can “figure out” defenses, without relying solely on Royce Freeman — who is the only thing keeping this team remotely in games. 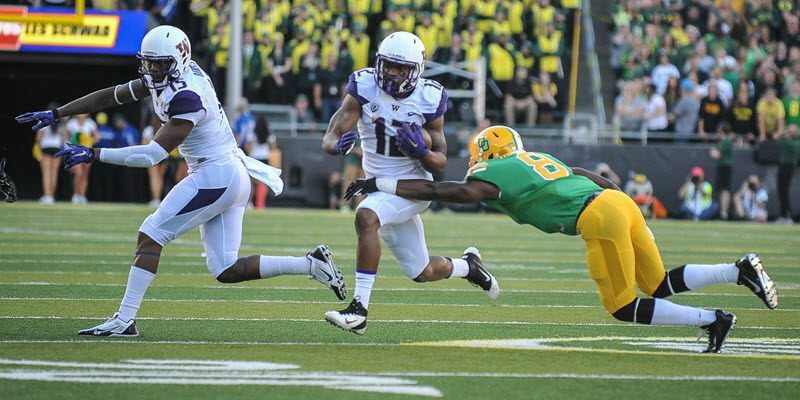 Let’s see if I can show you how the Huskies may try to stymie the Ducks offense. 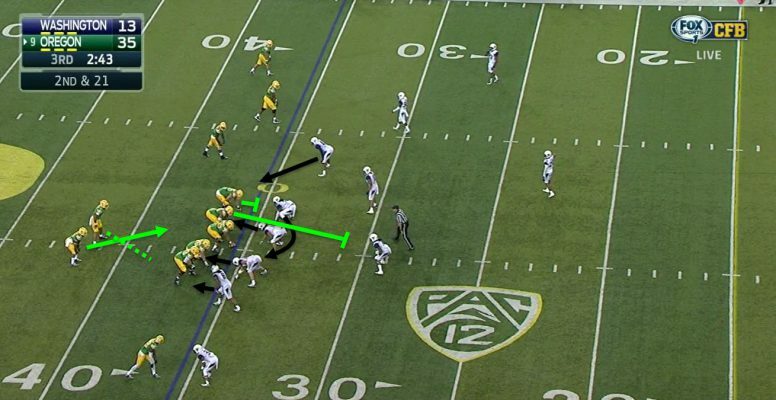 As you see in the screenshot above, the Ducks are lined up in trips left and the Huskies are lined up in a 3-4 defense. 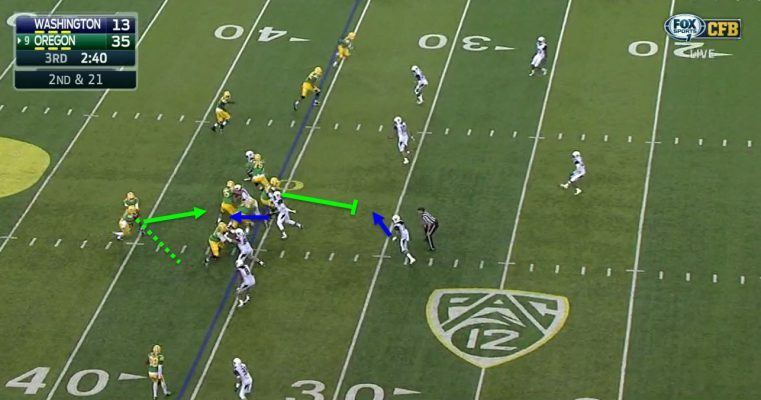 Mariota is forced to hand the ball off to the running back because of the left outside linebacker. At the snap, the Huskies’ right defensive end and nose tackle are going to run a stunt. A stunt is when the rushers cross, confusing the offensive line. The right outside linebacker is showing coverage, but he ends up rushing. The left outside linebacker is taking the quarterback. The defensive end is not going to miss this tackle. 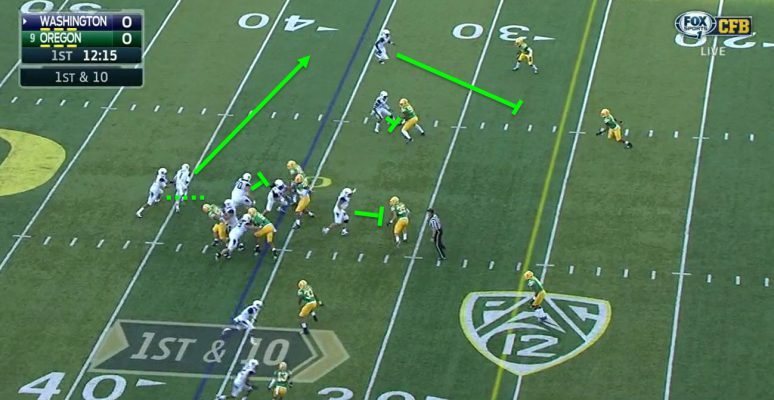 Mariota sees the linebacker taking away his lane, so he hands it to the running back. The offensive line is completely fooled by the stunt and they double team the nose tackle, leaving the right defensive end wide open to make a play. Stopping a run like this provides huge confidence boosts for the defense. The defensive end’s eyes widen as he remembers all the Oklahoma drills he did in practice that prepared him for this. In such a small space, the defensive end is going to make the tackle most of the time, as he does here. Last year, the Huskies didn’t have a true quarterback that defenses were afraid of to allow to sit back and throw the ball around. This year the Huskies do. Browning distributes the ball everywhere, four receivers have double digit receptions and two more have nine and seven. The young Ducks secondary is in for a test. Hopefully, after last week’s disaster, they will be hungry to prove themselves. I am making a road trip up to Seattle for this game, I would love to not make this trip and end up only watching the Ducks lose to one of the schools up North. I don’t think this will happen, but it will be close. Ducks win, 38-31 thanks to the return of Adams at quarterback.